Make this beautiful townhouse your “home away from home” as you explore the rich diversity of the Big Island! Located in the highly popular Waikoloa Beach Resort development on the sunny Kohala Coast, you’ll be staying in one the most desirable resort areas on the island of Hawaii. This spacious two story unit is in a peaceful and private location that opens up to grand views of the Kohala Mountains and the manicured gardens of the Colony Villas complex. With almost 1700 square feet of living area, you’ll have ample room to relax and enjoy the tranquil “Island Retreat” feel of the home! This townhome was designed with tropical living in mind. You’ll find features like granite kitchen counter tops, 18’ ceilings in the living room, tall windows for natural light and an open floor plan. The ground floor half bath is easily accessible. The living room furnishings include an oversized sectional for extra comfy seating, a 55” Smart TV and Blue-ray/DVD player. There is phone service for local and limited international calls, cable television with premium channels, and high speed wireless internet available throughout the home. The dining room table seats six with seating for three more at the kitchen bar. 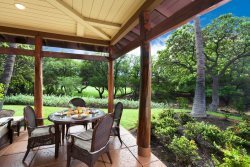 Off the dining area and living room you can access the lanai's outdoor seating to enjoy meals and the tropical breezes. The kitchen is nicely stocked with quality appliances, including coffee maker, rice cooker, BBQ tools and much more. Upstairs you will find a large master bedroom with a king bed, oversized walk-in closet, TV and Blue-ray/DVD player. The attached en-suite bathroom has marble countertops, double sinks, soaking tub and separate shower. You can enjoy the views of Hualalai, swaying palm trees and the golf course from the master bedroom balcony. Two additional bedrooms are on the second level, one with a queen bed and another with 2 twin beds. . A second full bathroom is located near the extra bedrooms, as well as a full-size washer and dryer. Central AC and ceiling fans in all rooms will add to your comfort. While enjoying this lovely home you will have access to beach chairs, beach towels, boogie boards, cooler and umbrellas. Enjoy free parking for 2 cars (1 garage and 1 assigned parking stall). Two twin roll-away beds are stored in the garage. Feel free to use these for additional sleeping up to 8 guests. Waikoloa Colony Villas has a tennis court, 2 beautiful resort style pools, 1 hot tub, 2 fitness rooms and BBQ’s at both pools. A corner unit in the 17 building, this home will put you steps away from all the complex amenities yet still provide the ultimate in privacy and unhindered views. In this prime location you’ll be just a 15 minute drive away from Hapuna Beach, one of the largest white sand beaches on Hawaii. Within the Waikoloa Beach Resort development you can enjoy two championship golf courses, as well as the Kings’ Shops, the Queens’ MarketPlace, and the Hilton and Marriott Hotels, all four offering a myriad of high quality shopping and dining experiences. The airport and Kailua-Kona are within easy driving distance, as are many of the island's best beaches for snorkeling and other water activities. the property was beautiful. it exceeded our expectations in every way. I loved that every room had a tv and cable. The master suite was spacious as well as the bathroom. beautiful, peaceful location. Instructions were easy to understand and worked beautifully. fit our party of 7 very comfortably. would definitely book this place again!